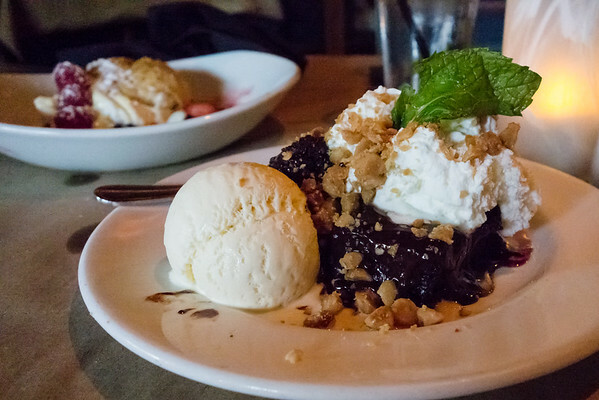 A review of Bonefish Grill in Chattanooga, TN. 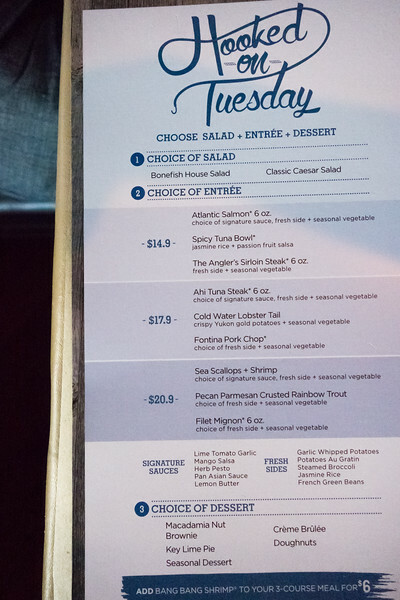 We made reservations for Bonefish Grill on a Tuesday evening, without any knowledge of their “Hooked on Tuesday” specials! What luck. 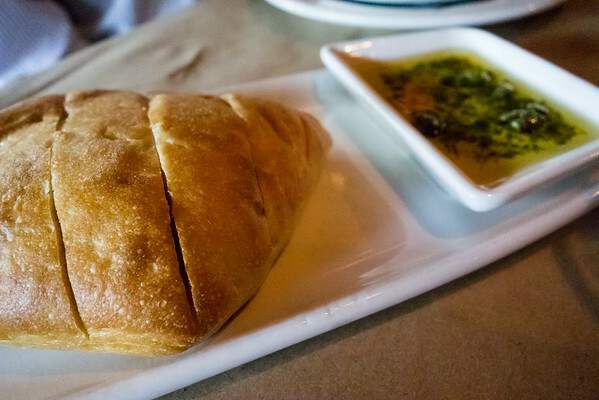 These kind of appetizer to dessert specials are our favorites! When we walked in, we took a moment to admire their new look and then we were seated immediately. Apparently the Tuesday special is popular because shortly, all tables were filled. My only complaint about the ambience was that while the soft, dim light was undoubtedly flattering to me, it made taking photos tricky. 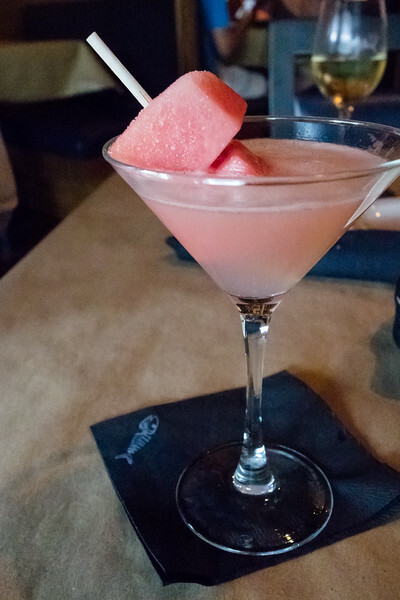 We started off with drinks and I immediately chose the Fresh Watermelon Icicle Aphrodisiac™ Martini. It was everything I hoped it would be. Sipping it, I settled in to look at the menu. Everything sounded good, and I was torn between the Spicy Tuna Bowl and the Pecan Parmesan Crusted Rainbow Trout. I settled on the trout and the hubs settled on the Ahi Tuna Steak. For salads, he chose the house salad and I chose the Caesar. 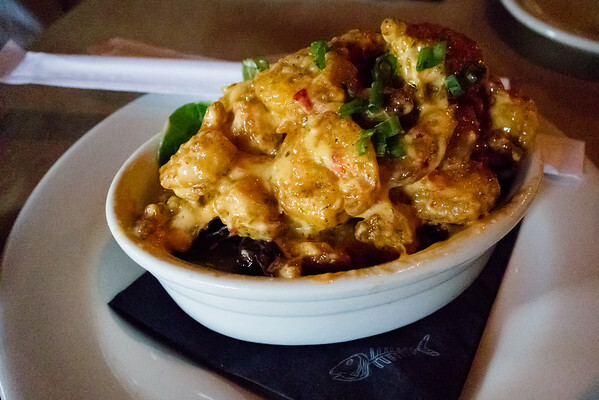 We also couldn’t resist to add the Bang Bang Shrimp appetizer for just $6! Sipping my watermelon martini and slipping bang bang shrimp into my mouth, I was in my happy place. So good. The appetizer serving size was very generous! The shrimp was tender inside, crispy on the outside and tossed in their spicy sauce. After that I was ready for my second martini, the fresh pineapple martini. 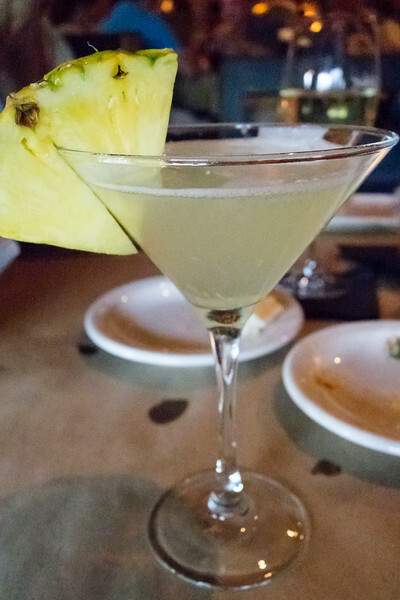 While I liked the watermelon martini, the fresh pineapple was amazing. This is the one I will have the next time we come. Our salads were perfect. My Caesar salad was balanced with just the right amount of cheese and croutons. The house salad was several steps above most restaurants house salads. Bread was served with the salads and it was a lovely rustic loaf with an oil and herbs dipping sauce. Excellent. Both entrees were excellent. 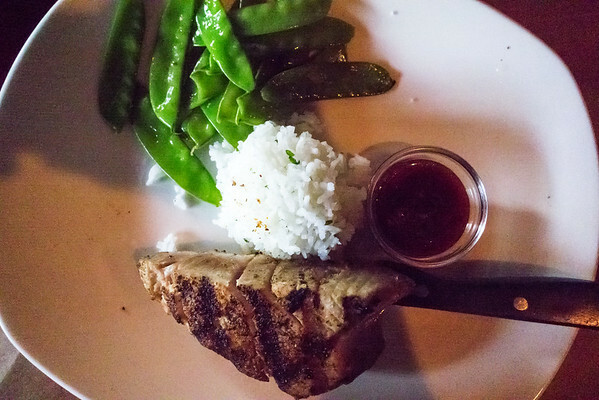 My husband’s tuna was cooked perfectly, as were the snow peas and the rice. He loved the Asian dipping sauce. 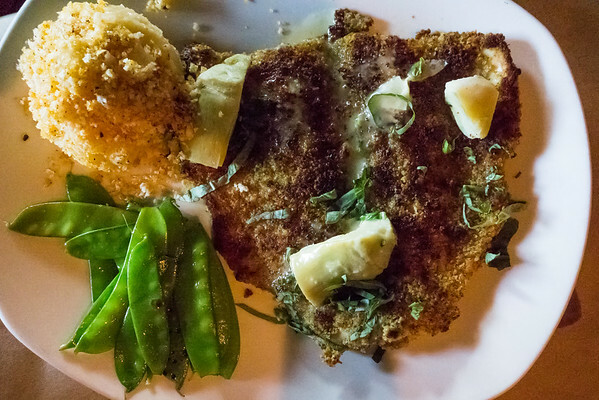 My Pecan Parmesan Crusted Rainbow trout was also perfect and a very generous size. The gratin potatoes were rich and creamy and the snow peas tender yet still crisp. By this time I was already starting to get full, so to save a teeny bit of room for dessert, I took half of my dinner home for lunch the next day. The desserts were the perfect ending to a lovely meal. 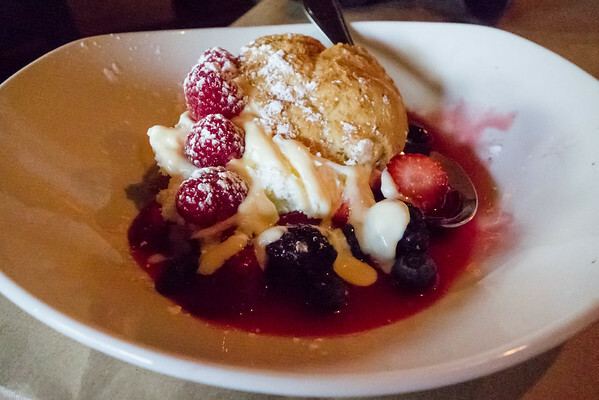 My husband’s seasonal berry shortcake was light and delicious. My macadamia nut brownie was also very, very generous! I ate the ice cream and couple bites of one of the brownies (yes there were two!) and took the rest home for the next day. When we shared them the next day we couldn’t believe how rich, chocolatey and delicious they were – they easily fed two people! I also have to mention how good the service was. Our waitress, Jennifer, was amazing. She answered all of our questions, recommended the potatoes (great call!) and kept our water glasses filled and table clean throughout the whole meal. A very friendly man (manager?) brought our drinks and also checked back with us. Not that you need an excuse to visit, but if you are looking for a good time to visit and help a great cause, I suggest you visit from 4 p.m. to 10:30 p.m. on Monday, July 13 as the Chattanooga Bonefish Grill will donate 15 percent of sales to the Salvation Army of Chattanooga, a nonprofit that has been supporting those in need for over 130 years. Additionally, the restaurant will host another Benefit Night on Monday, August 3 from 4 p.m. to 10:30 p.m. for Big Brothers Big Sisters of Greater Chattanooga, the nation’s largest donor and volunteer supported mentoring network for children. The new look for The Bonefish Grill is so warm and inviting. It is decorated in earthy tones with hardwood accents and embellished wood flooring. I’m sad that I didn’t get a chance to take a photo of the bonefish sculpture made of stainless steel and sequined scales. I definitely will on my next visit! You can conveniently make reservations through Bonefish Grill’s online reservation system. With a few simple clicks, guests can book their polished-casual experience online at www.bonefishgrill.com/chattanooga or by calling 423-892-3175. Reservations are recommended but not required, and walk-in guests are always welcome. We received a complimentary gift card to try Bonefish Grill, but all opinions are my own. We will definitely be back, that Spicy Tuna Bowl is calling to me!